Standard: Casing and diffusers made in GJL250 Cast Iron, shaft in AISI 420, bearing bushes in bronze. On request: AISI 316 shaft and special bearing bushes. Multistage centrifugal pumps with closed impellers TS. Discharge sizes from DN 32 to DN 50. TS 31-32 range is only available with mechanical seal, TS 40-50 range is available both with mechanical seal and gland packing and cooling chambers are supplied as standard equipment. 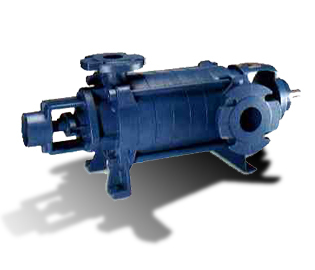 TS pumps can handle clean or slightly contaminated liquids. They are also used for boilers feeding, fire fighting plants, autoclaves, water supply systems, irrigation, washing plants, to pump hydrocarbons and whenever high pressures are required. TSB - TSKB: Independent frame with oil lubricated bearings, with ball bearing and bearing bush (TSB) or with double bearing (TSKB). TSL - TSKL: Independent frame with oil lubricated bearings with lantern for coupling to flanged motors, with ball bearing and bearing bush (TSL) or with double bearing (TSKL).